Whether you have purchased a lived in home with granite countertops, designing your own home, or renovating your kitchen and are looking to change the countertops to granite, this guide will help you maintain your countertop in the best condition and help you keep it clean, preventing stains and damage. If you do happen to find stains or damage, please refer to this guide to help you repair your granite countertop (link to repairing guide). Follow these steps to keep your granite countertop looking as slick as the day you purchased it (or the day you bought the house). As with any kitchen countertop, you are going to be using it daily. If you have a family, it is going to be used multiple times a day, with all manner of food particles and fluids splash, spilling, though hopefully not drying, on the countertop. As granite is a porous stone, it is worth considering that daily maintenance is of greater importance, and one should consider preventing any food from settling onto (and eventually into) the granite countertop surface. It is best to clean the countertop with warm water and a very small amount of dish soap, using a non-abrasive cloth. You do not want to use your pot-scrubbing brushes on a granite countertop, no matter how much easier you think it might be. Abrasive brushes can damage the sealed surface of granite, meaning you will need to reseal the surface much sooner than you otherwise would have needed to. Antibacterial dish soap is the best option as you do not want molds or mildew slowly setting into your granite. Once you have washed the countertop, rinse the surface and then wipe it down with a new, clean, dry and non-abrasive cloth. It is important to prevent the deterioration of the surface of the granite countertop, which should be sealed properly and professionally. As the sealed top degrades, it opens up avenues for damage, such as stains, scratches, and bacterial growth. An easy way to prevent unnecessary wearing down of the granite countertop surface, is to keep heavy, hard, or electric items off the countertop when not in use. Items such as blenders, which heat up quickly, and usually contain hard edges on the sides, or other items such as serving stones, chefs knives, or a mortar and pestle, can all cause damage to the surface if they happened to be dropped or bumped around. Break baskets, serving ware, cold pots (not pots that just came off the stove), etc, are all acceptable. 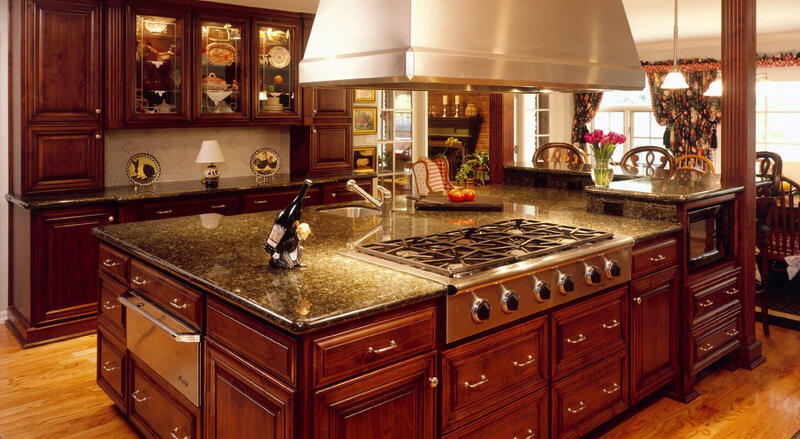 While the sealed surface of the countertop is more or less heat resistant, the stone underneath is not, and prolonged exposure to very hot items, such as pots or steaming food, will cause damage overtime. We suggest that you use a pot trivet, which is usually made of cork, cloth, or silicone, which is designed to support a hot pot or pan and distribute or block the heat from reaching the surface underneath. Having a few on hand is always a good idea. Step 4 – Do NOT cut on your granite countertop! One of the worst things you can do for both your granite countertop and your knife collection is to use the granite surface as a cutting-board. The hard surface of granite will dull your knives very quickly, and may even damage them. The same goes for the granite – the sharp edge of a knife can quickly cut into and wear away the sealed surface, causing stains and other damage to the granite underneath. However busy you are, however fast you need to make a dish, use a cutting board and keep food and knives off the granite countertop!